Her new book on the subject, Burning Country: Syrians in Revolution and War, co-authored with Robin Yassin-Kassab, is out now. But there is another story to be told too. The story of countless inspiring and courageous individuals and communities who have tried to keep the original values and goals of the uprising alive even in the most tragic of circumstances and in the face of the most savage repression. Their stories are often not told, and they rarely receive solidarity. This is why we wrote this book – to give voice to the voiceless. In 2003 the West began invading countries in the Middle East, launching major wars and conducting experiments in social engineering ostensibly in the belief that it could bring democracy to the region on the back of American tanks. The attempt of course failed, and caused major de-stabilisations. Yet less than a decade later the people of the region themselves have put democracy into practice. This was not a democracy forced on them from above, not subjected to the constraints and whims of the world’s great powers, but something of a much more radical stripe – a democracy from below. From the first days of the uprising local committees formed in neighbourhoods across the country. These horizontally organised forums were primarily composed of youth activists and included women and men from all backgrounds and all of Syria’s diverse ethnic and religious groups. In their committees, they organised demonstrations calling for the fall of the authoritarian regime, as well as civil disobedience campaigns including strikes in workplaces and universities and campaigns for the release of political prisoners. Over time, and in the face of the savage repression which dissenting communities faced, they began to collect and distribute aid to areas under bombardment and siege. Many activists involved in the local committees and early demonstrations were rounded up and detained in the regime’s torture dungeons. Others were later targeted by Daesh (ISIS) forcing thousands more to flee the country. But some remained and continued their work. The White Helmet Civil Defense volunteers – those who are the first to arrive at the scene to pull the victims of barrel bombs from the rubble and provide medical assistance – grew out of the local committees. The White Helmets also conduct awareness raising campaigns, teaching people how to survive regime and Russian airstrikes, and provide training in first aid and psychological support for children. As the state collapsed or was beaten back, and Assad lost control over two-thirds of the country, local councils were formed in liberated towns and cities to administer the basic necessities of life. This included providing public services such as water, electricity, education and health care as well as coordinating with local armed groups to ensure security. Hundreds of councils now exist across the country, and the vast majority are democratically elected. And this in a country which has not witnessed a free and fair democratic election in over forty years of Baath rule. The local councils were based on the vision of Syrian anarchist Omar Aziz who believed that protests alone were insufficient to bring about a radical transformation in society, and that a new society should be built from the bottom up to challenge authoritarian structures and provoke a transformation in people’s value systems. These grassroots councils are not without their imperfections, and there are enormous differences between areas in terms of both vision and ability. Some have failed to shake off authoritarian structures inherited from the regime, others have been beset by tribal or political rivalries. A few have struggled to keep their independence from armed groups, or have been hijacked by conservative Islamist forces. Women tend to be severely under-represented (except in the Kurdish regions of the north where similar structures have been much more inclusive). Some councils have received limited amounts of funding from Western governments and NGOs, and some local activists feel this has reduced their independence. Yet overall the councils are the forum through which communities have kept functioning in the face of foreign airstrikes and Assad’s scorched earth, despite remaining chronically under-funded and under-supported. The councils are putting local democracy into practice, providing a potent alternative to both the regime and Daesh. Earlier this month (January 2016) local council elections took place in rebel-held Eastern Ghouta. Whilst military leaders were not permitted to run for election, militia members were. Yet civilians won all of the seats and the decision was accepted by armed groups. This shows that progressive elements within the uprising remain. The elections in Eastern Ghouta, and elsewhere, have scarcely been noticed by the international media. Another aspect of Syria’s struggle which has often been overlooked is the transformative cultural revolution. Prior to 2011 there was no independent media in Syria, and dissenting journalists and bloggers were persecuted by the regime. Now dozens of independent news agencies and radio stations have been set up, and more than 60 newspapers and magazines. One of these is Enab Baladi (Grapes of My Country) a newspaper published by women in Daraya, a suburb of Damascus that has been besieged, shelled and gassed. Remarkably, the magazine focuses on unarmed civil resistance. Another is the ANA New Media Association, which British-Syrian activist Rami Jarrah established with others. Rami has recently been reporting on the ground from Aleppo, a city which few international journalists dare to enter, to bring the voices of ordinary people to the world. From there he has reported on both Russian and regime airstrikes, supposedly targeting Daesh (which is not present in the city) but in fact reducing civilian neighbourhoods to dust. And the citizen journalists of ‘Raqqa is Being Slaughtered Silently’ risk everything to report on life in the Daesh-held city. A number have recently been assassinated by Daesh militants, only re-doubling the commitment of their comrades to continue their opposition to all forms of tyranny. ‘You’re supposed to protect us/How could you take advantage of us?/We didn’t start a revolution to replace his boot with you/Not to create a similar tyrant/We’re the ones who give you protection and power/When you try to cross the line we won’t permit it’. Along with their dream of dignity and freedom, Syrians have carried their revolutionary experiences of self-organisation into exile. Once refugees clandestinely snuck across borders under cover of nightfall. Now thousands march across Europe demanding their rights. In the past few months I’ve been travelling in the Middle East and meeting with refugees who often live in the most desperate of conditions. In Jordan I met young people organising campaigns to help the vulnerable such as the elderly who struggle to cope alone, or to raise awareness of violence and harassment against women. One young man who dreams of becoming an actor is organising a theatre group for children in Zaatari camp which has recently put on a play for residents. In the Kurdish region of Iraq I met another who had started a campaign with friends to clean their camp of garbage. When I asked why, he replied: ‘If we do nothing then who’s going to help our community? Are we going to rely on foreigners and NGOs?’ People I spoke to wanted to return to Syria and re-build their country. But as they do not believe this will be possible any time soon, the vast majority of young people dream of making the journey to Europe or Canada. They are aware of the dangers, but with limited access to work and education in the region they feel they have few other options. Those who have reached Europe’s shores have been met with an outpouring of solidarity, as well as rising xenophobia. In Greece ordinary men and women have provided life-saving assistance to those who have made the perilous journey across the sea, often long before assistance from international organisations has arrived. Some have squatted buildings, working hand in hand with refugees, to provide Syrians and others escaping war and violent repression with shelter and food. Many British people have gathered clothes, blankets and other essential items to send in aid convoys to ‘the Jungle’ camp in Calais, France, where conditions are so grim that Europe should hang its head in shame. This response to refugees is an image of the ties of solidarity that should have been built between Western and Syrian activists during the first five years of the revolution and counter-revolutions. Instead, too much Western commentary has interpreted Syria according to pre-existent narratives (which are often totally inaccurate, as well as orientalist). Too few Syrian voices have been heard. Solidarity with Syrians failed to emerge over the past five years. It mustn’t fail over the next five. I hope our book shows that there are still many wonderful and impressive communities and initiatives to support in Syria. They need support now more than ever. 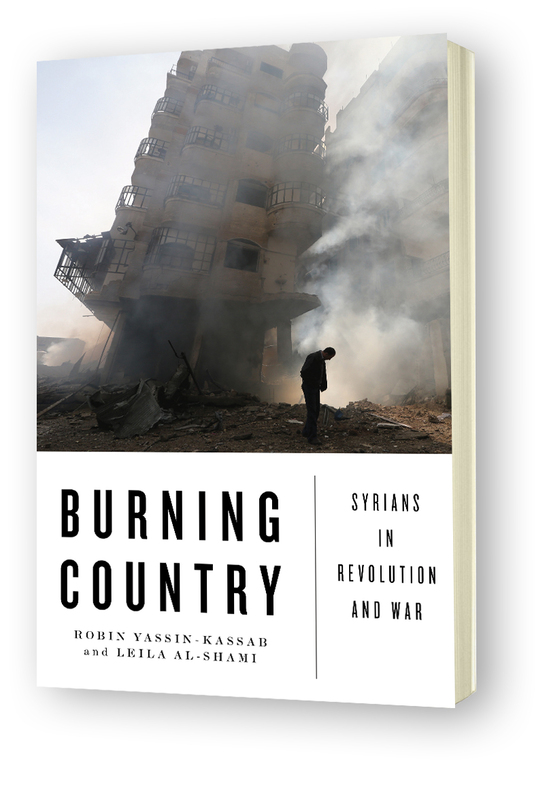 Burning Country: Syrians in Revolution and War is available to buy from Pluto Press.